MYLAPORE TIMES » New beach cleaning machines starts operating at Marina. New beach cleaning machines starts operating at Marina. 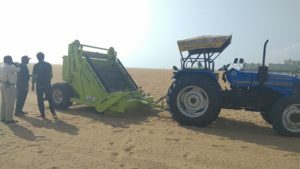 Recently, a set of 8 beach cleaning machines have been procured by the Greater Chennai Corporation for the Marina Cleaning drive. Of the 8 machines, 2 will operate at Elliot’s beach. And the remaining 6 will clean the sand at Marina. “These machines work every day from 6 am to 2 pm for the stretch from the lighthouse to labour statue. It also covers the area from the lighthouse to Srinivasapuram, leaving the fishermen’s market area in between. We collect around 4 to 5 tonnes of garbage every day,” says a Corporation official. “The new machine leaves behind the fine sand after picking up the minute particles like peanut coatings, threads and spoons, “ he says. “For cleaning in between the shops the old machine is used since the new one is wider. And in places where the machines cannot reach, the area is manually cleaned by our workers,” he says. They have also installed stainless steel dustbins till the area near the seashore, signboards, sea view seating areas and shelters as a part of the drive. This entry was posted on Friday, February 8th, 2019 and is filed under Civic. You can follow any responses to this entry through the RSS 2.0 feed. You can skip to the end and leave a response. Pinging is currently not allowed.